The Workers Club AW18 collection uses the best natural fibres to create a rugged yet refined workwear aesthetic. If you’ve been a Rake reader for any amount of time, you’ll be aware that we’re champions of artisanal brands that often have a heritage that can date back centuries in some cases. As luxury consumers ourselves, we place a great deal of importance on legacies, and rightly so: longevity, in this industry, is a trusty signifier of the attention to detail, peerless quality, and adaptability that combine to make products truly timeless. But all too often, this focus can lead to a sort of myopia: when squinting so far back into the past, one can very easily overlook what’s right there in the present. The Workers Club, founded in 2015 by husband and wife duo Adam and Charlotte Cameron might only be the best part of four years old but is one such fledgeling brand that although short on legacy, is spilling with its constituent ingredients. The Rake: So perhaps the most obvious first question is how you came upon the name ‘The Workers Club’? Adam Cameron: There was a Rodchenko exhibition on at the Tate Modern, this is going back at least 10 years. It was all about constructivism. Rodchenko had created a place called the Workers’ Club, in which he was trying to challenge the notion of the worker in Communist Russia by creating a more fun working environment. He made hinged tables and revolving chess board desks. I really loved the concept and the idea of a collective and collaborative workspace. So we kind of sat on the idea for 10 years and now here we are! The Rake: How would you define TWC? What’s the DNA of the brand? AC: Well, outerwear has always been my passion. Pretty much every design job I’ve had, it has been my category, so you could say we’re fundamentally an outerwear brand. What really excites me, however, is fabric. I love working and developing relationships with mills to create something really special and unique. I sound like an old crony, but it’s not something they teach you at university. A lot of designers won’t know how a certain fabric will drape or cut - you learn it from hanging around mills. It took us six months to find the perfect fabric for our signature Works jacket. Charlotte Cameron: Everything we create starts from an obsession over a certain fabric. The Works jacket, for example, is made from a fabric called H2O, which is 100% cotton, proofed in the yarn. When it gets wet the yarns expand and it makes a water-resistant barrier. Many technical fabrics have a membrane which doesn't feel great, but this is totally breathable. AC: Fabric is what sets us apart, and we go to great lengths to find the best, such as our raw Japanese selvedge denim. Nobody produces chambray superior to that of the Japanese. You could compare some of our products to other brands but I believe that when you actually look at the detail and the finishing you can really tell the difference. The Rake: It seems that there’s a military inspiration in a lot of the silhouettes and functionality of your pieces. Would I be right? AC: Well, yes…there is that, but I also remember going to the States because my mum’s American. I was 12 and I wanted to buy a Vietnam war helmet… it’s not like a weird thing, more of a design thing… I was always into Action Man and army stuff. I don’t go around shooting people, although I would drive a tank if I had one. But seriously, everything comes from military and workwear - they are the two pillars of menswear. Where I differ from Charlotte perhaps is that everything has to be functional. I hate anything that’s not functional. There has to be a justification for why every little detail is as it is. The Rake: Do you both come at design from different angles or are there many synergies with how you work together? AC: We’re actually better working together. It was worse when we were living our own separate work lives - it sounds cheesy but we do really complement each other. If we were both like me it would be really miserable!. We end up creating something we wouldn’t have created by ourselves. CC: But you’re good at it! We’ve had to because it’s just the two of us. Things work out, you just have to give it time. The Rake: Speaking of time, how long have you both known each other? AC: Well, it must be about 19 years now. We were both studying fashion at university which is where we met. I was born in London and then moved out to the suburbs but I always had this feeling that London was where I had to be, especially for fashion. I managed to get a place at the London College of Fashion and it was a really big deal, but then in quick course I realised I hated it. It was really really tough and I felt out of my depth. I wanted to transfer to a four-year course but at that time there really weren’t that many in the country, maybe only two or three. There was a very well regarded course in Derby so I transferred there. I wanted to get away from London but at the same time, that was as far away as I could feel comfortable! Anyway, my mentality was Derby is in the north. That’s where we met. Charlotte had a boyfriend, I was sort of in the background. CC: It was so obvious you were from London, I mean you dressed really weird. AC: I did dress ridiculously. It was kind of what you did as fashion students. I seemed to go through lots of different phases with my hair. There were a couple of Afro-Caribbean girls in my year and they treated me like a doll so I had cane rows at one point, it must have been around the time that David Beckham was doing it. CC: You weren’t helping yourself! One day you came in and it was completely shaved off. You used to wear suits because you were working with a tailor on Saturdays and you came in with this old three-piece suit on and a completely shaved head. You looked like an escapee! AC: I think I just wanted to shock people a bit - you can as a fashion student, that’s what you do. Were we together then? CC: Yes! But looking back now, everyone was doing it in their own way. AC: I used to wear salopettes at one point. CC: Let’s not dwell on that. The Rake: Tell me about the AW18 collection. How have your core products involved? AC: We’re always inspired by the men who wear our clothes and this season is no different. 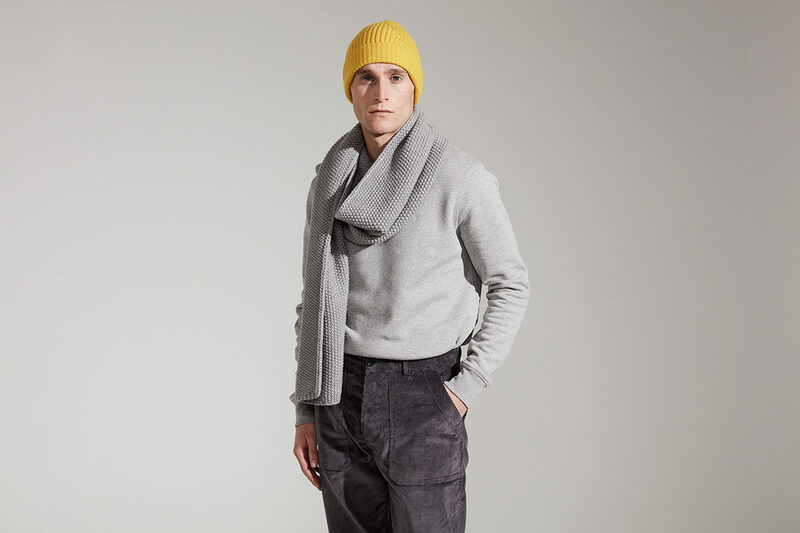 We’ve given traditional menswear classics our signature TWC treatment, so think corduroy trousers tapered at the ankle and rib-knit beanies in bright, vivid colours. As ever, the best-loved classics remain, including the ultimate cotton tee, brushed back cotton jersey sweats and the famous knit socks. We’ve always imagined the dichotomy of the city and the country to actually be much more fluid than people think, or their wardrobes allow, so denim and outerwear definitely have an urban aesthetic while the colours and textures offer up a more rustic feel. This season’s lookbook has been created in collaboration with world-renowned stylist William Gilchrist and acclaimed photographer Dan Annett, and I think they’re really captured this transition beautifully. The first drop of AW18 collection, now available on The Rake, consists of key denim pieces and outerwear to take your workwear wardrobe up a notch or 10. From natural raw selvedge jeans to a four-pocket denim jacket with brass hardware via the signature TWC shell jacket, they are the hard-wearing elements of a contemporary wardrobe that you’ll keep coming back to time and time again.